If no underlying heart disease is detected, the heart’s response to exercise is normal, and there are no symptoms of low cardiac output, treatment may not be required. Your doctor may choose to monitor your heart rate and rhythm periodically. 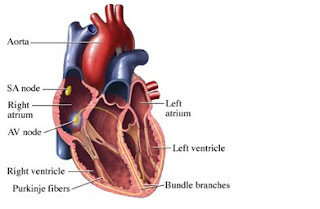 People with cardiac symptoms and conditions usually receive treatment. • Artificial pacemaker–this device may be either temporarily or permanently implanted under the skin in the chest wall. Whenever the heart rate drops too low, the pacemaker takes over the job of providing the electrical impulses needed to establish and maintain a normal heart rhythm. • Treat underlying conditions that might lead to bradycardia. • Carefully follow your doctor’s directions when using medications (especially those that can potentially cause bradycardia). o Maintain an appropriate weight. o Consult your doctor about a safe exercise program. o Eat a healthful diet, one that is low in saturated fat and rich in whole grains, fruits, and vegetables. o Treat your high blood pressure and/or diabetes. o Treat your high cholesterol or triglycerides.